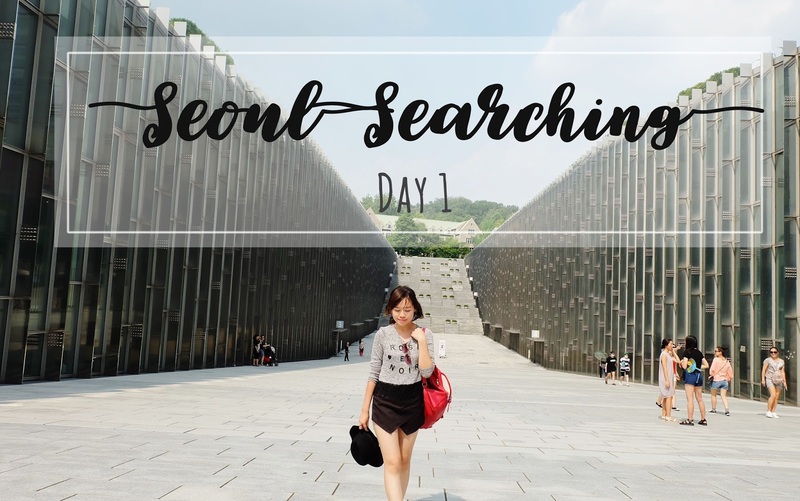 SEOUL SEARCHING DAY #1: EWHA WOMANS UNIVERSITY, HONGDAE & LOTTE MART - Eunice C.
After spending four days in South Korea, we finally came to its capital! While we were on our way to our hostel after landing in Gimpo International airport, I recalled the laborious moments of climbing up many flights of stairs and interchanging from one subway line to another while carrying our heavy luggages with us. The subway stations in Seoul are insanely huge and capacious! Even interchanging subway lines required a lot of walking as the subways from two different lines were located far apart from each other. Well, not to complain, but we were just getting used to it. Before heading to our first destination, we had our first meal in Seoul. Mister Bossam was nestled in between a row of shops near Ewha University. Since it is one of Seoul’s most famous joints that sells Bossam, we were excited to try it. Its inconspicuous entrance led us up a flight of stairs and eventually, to the cosy and dimly lighted restaurant. 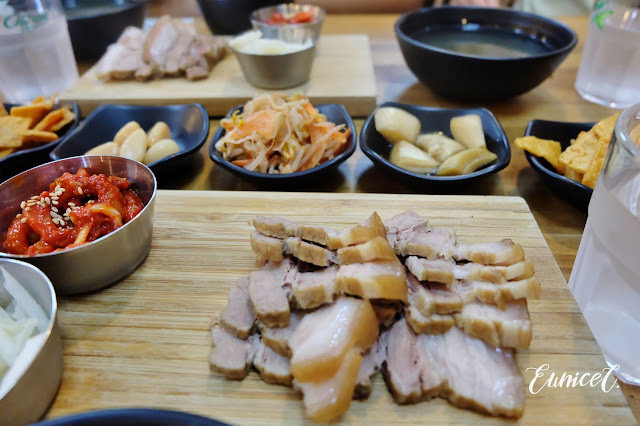 Bossam is a Korean traditional dish, featuring thinly sliced pork belly as the main course. As expected, the main dish was accompanied by a free flow of side dishes: kimchi, pickled onions with garlic, bean sprouts, and tofu skins. You may even help yourself with the seaweed soup and brown rice. Such healthy choices of staple food. The pork belly was juicy and tender, giving me a deep satisfaction. The lean meat and fats were in the right proportion, to my delight. There were actually other types of bossam sets on the menu, i.e. garlic bossam, spring onion bossam, and an all-star bossam, which is the combination of the two bossams above. We picked the basic (plain type) bossam platter since it was our first try and we wanted to experience the original taste. Ewha Station Exit 2, walk straight and cross 3 intersections. Continue walking straight until a zebra crossing. Cross the zebra crossing and turn left and walk straight for 20m. Mister Bossam will be on your right. The first time I knew about Ewha Womans University was from ‘The Calligrapher’s Daughter’, a novel written by Eugenia Kim. The story portrays Najin Han, the calligrapher’s daughter who is determined to pursue her education and fights for her future during the Japanese occupation in Korea. 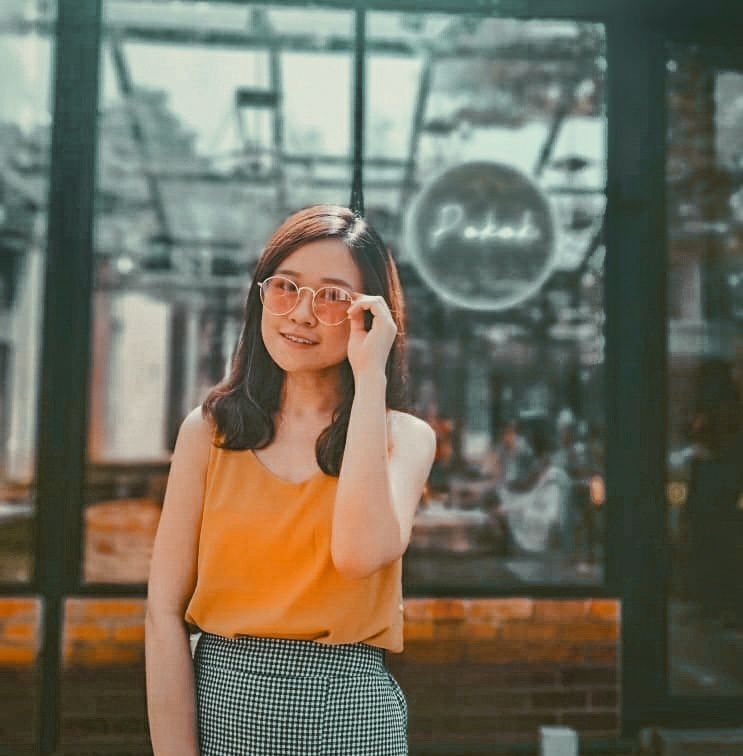 She aspires to continue her education in Ewha Womans College, Korea’s first girl’s school, and subsequently became Korea’s only women’s college over the years since then. At present, it is known as Ewha Womans University. Having a deep first impression about this university after knowing its long history, I was totally looking forward to the visit. Never have I been so excited for a university! Its stylish and modern architecture had made Ewha Womans University a popular tourist attraction. As we approached the campus, we found ourselves walking through the gradually descending ‘valley’ that led us to a stairway. But we did not go too far. There were two symmetrical buildings guarding the ‘valley’, at each side. The glass window panes of the building were arranged in a vertical brick-like manner. Definitely the coolest campus I had ever visited. It gives such good vibes and conducive learning environment. I even feel like studying just by being here! I wish I could study here, either as a foreign exchange student (which I am too late for that!) or as a post-graduate which is highly unlikely to occur. Just across the road from the university, you will find Ewha Womans University shopping street. Isn’t this the best campus for ladies? I can totally see myself going for a retail therapy after having a bad day in campus. 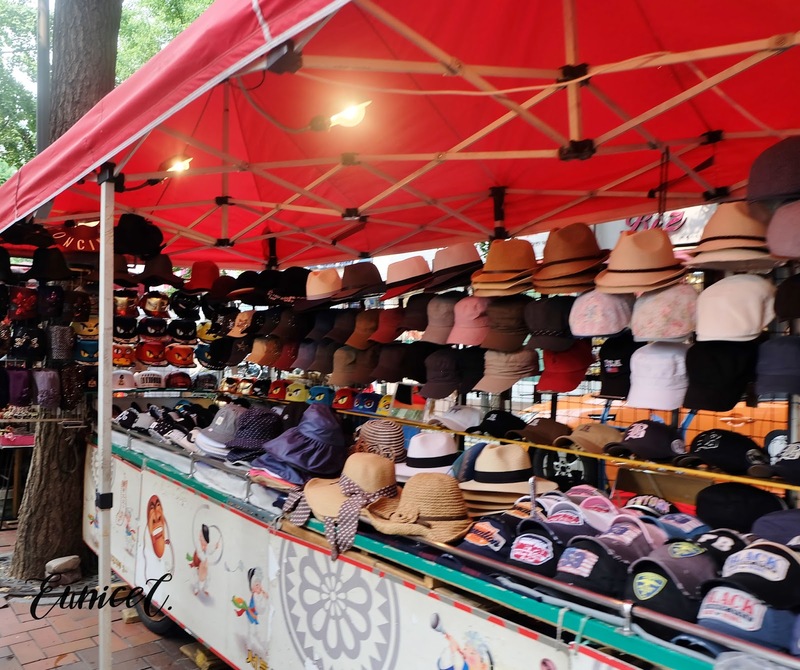 This shopping street is one of the most famous shopping areas in Seoul, offering affordable apparels, shoes, and bags in the latest fashion trends. 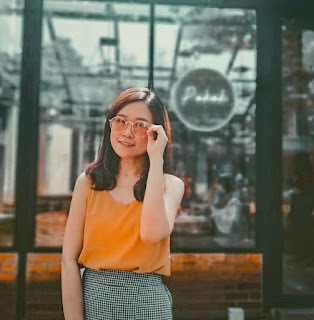 You can get all the latest Korean-style street fashion that is commonly seen everywhere, ranging from pinafore midi dresses, basic white or striped tops with broad sleeves to off shoulder tops. Almost all the shops sell similar outfit designs, as you may find certain items repeating as you visit more stores. Honestly, it was not as cheap as it was claimed to be. Of course, it was relatively cheaper than the South Korean homegrown boutiques or the local designer labels. As for apparels, the cheaper prices were normally around 5000won (~RM18) and they were either mostly basic wears or they were made in China. I did not believe it, until a shop owner told me that clothes with lower prices are normally originated from China. True enough, the three words, “Made in China” stared back at me when I took a look at the clothes label. Well, I did not see a point of buying clothes from China in South Korea. You can easily get them in Malaysia or from Taobao with a much, much lower price. Apparels that have more sophisticated and trendy designs with better material quality is usually priced above 10 000-20000 won (~RM35-RM70). I would say it’s pretty reasonable! However, I did not find anything that is from my shopping checklist that was within my budget. I actually found a chic-looking and softly textured drape-front coat that had one of the many designs that I desired. Did I not tell you that I am obsessed with outerwear? Well, sadly it was over my budget. It was 30 000 won (~RM105.9) after negotiation. There were a few shops that sold a fixed price of 10 000 (~RM 35) won for a variety of bags: backpacks, sling bags, bucket bags, clutches, etc. Shoes are normally priced at 10 000 won as well. 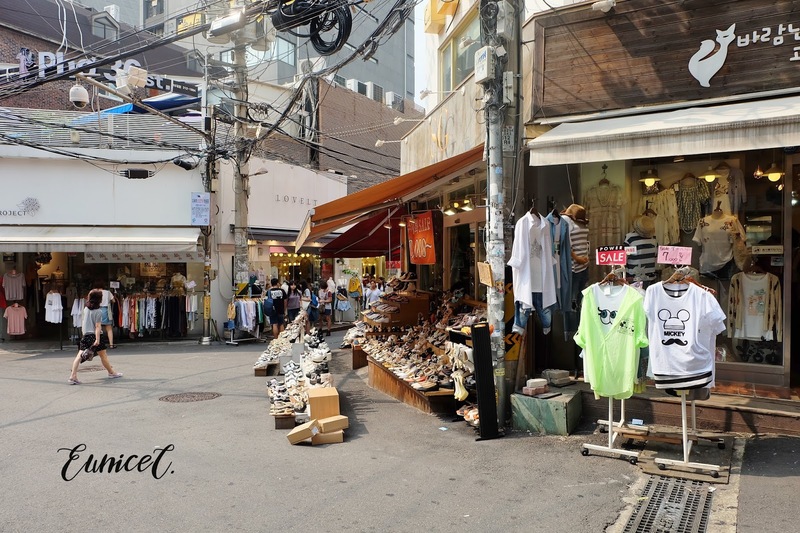 Known as a youth hub in Seoul, you may experience most Korean pop culture in this district. Hongdae has one of the most happening nightlife scenes in Seoul. Entertainment spots such as night clubs and lounge bars filled the streets of Hongdae. However, we were only there for the afternoon. We walked through the streets of Hongdae, passing by a collection of artistic street art. Living up to its reputation as a pop culture district, it allows the youths to express themselves freely in the form of art and music. Students from Hongik University can just go partying after class! 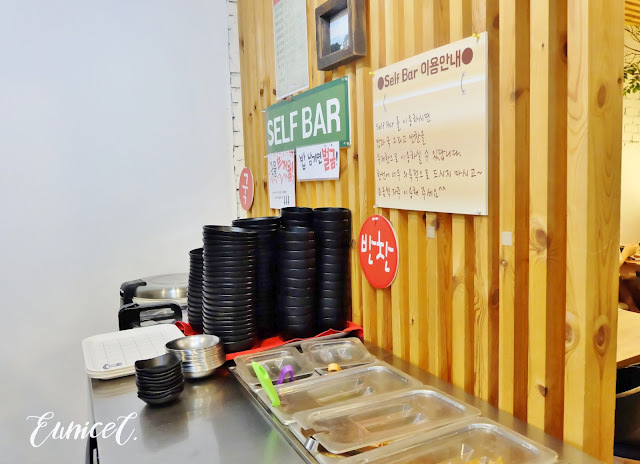 Nestled in between a row of shops at the main street of Hongdae is a famous dessert joint that sells takeaway tiramisu ice cream in a plastic champagne flute. 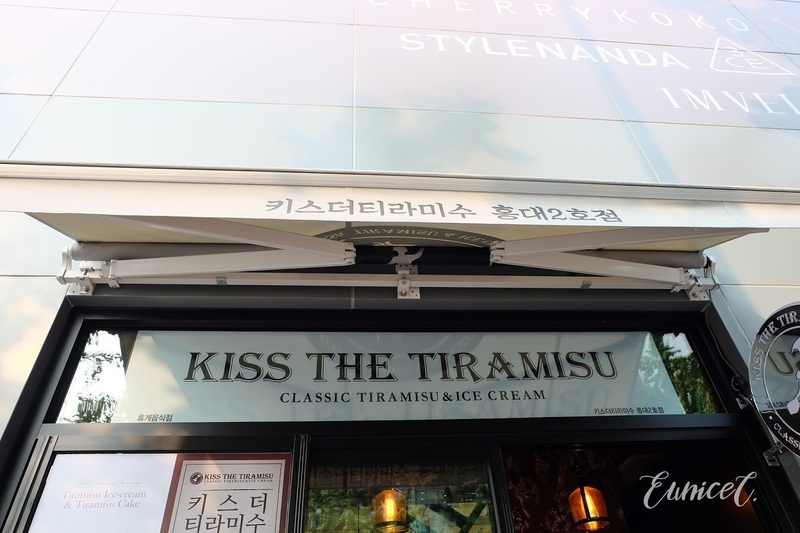 Kiss The Tiramisu has only three items on its menu: the original tiramisu ice cream, banamisu ice cream, and the tiramisu cake. We only tried both types of ice creams. The original tiramisu ice cream contained cheese that was mixed with the ice cream, finished with sprinkles of cocoa powder. There was also coffee that gave a hint of bitterness to the tiramisu ice cream. Banamisu ice cream had a strong flavor of banana, slightly similar to banana milk. The original tiramisu ice cream did not leave me a deep impression as it did not turn out as nice as expected. I probably set the bar too high for this ice cream as it was a highly raved dessert in South Korea. It was too sweet for me, and the sweetness became more evident as the ice cream thawed. Since it is a tiramisu ice cream, I would prefer a little bit more bitterness in the ice cream. Regardless, I still prefer the original flavor over the banana flavored version. At Exit 9, go 150m straight, and cross the street. It was only our first day in Seoul and we had already turned on our shopaholic mood for Korean snacks and candies. Lotte Mart is South Korea’s leading discount store that sells a variety of household products and groceries. We were only interested in the latter. These Korean snacks were highly recommended and had plenty of good reviews by bloggers and friends. Some were popularized by Korean dramas. But, are they really worth the hype? 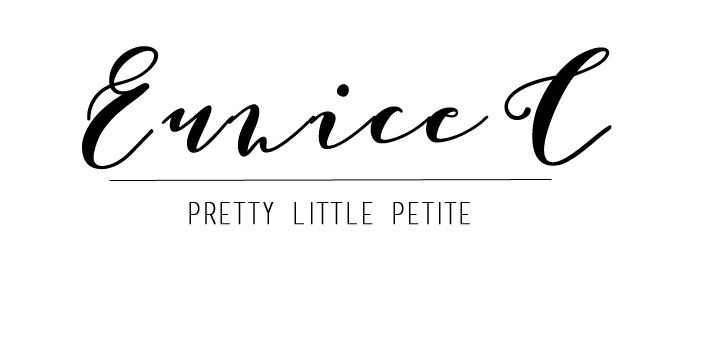 Let’s find out in my upcoming post about my shopping hauls in Lotte Mart. We went to the Seoul Station branch which was easily accessible by subway. Upon reaching, each of us grabbed a trolley and started shopping right away! It is always better to create a shopping/ to-do- list after doing lots of research online about snacks or food recommendations. I picked all the famous biscuits and snacks, one of each, for trying purposes. It was amazing to explore the hypermarket as there were so many cool and interesting Korean brands which could not be found in Malaysia, sadly. Lotte Mart offers instant 10% tax refund if you purchased above 30 000 won (~RM105). Be reminded that this hypermarket does not provide plastic bags, unless you pay for it, if I’m not mistaken. Instead, recycled boxes and tapes as well as ribbons are provided. Basically, you will have to select a box with an appropriate size and package your goods into it. From Hongik University take Line Airport to Seoul Station (Seoul Subway Line 1, 4), Exit 1. The Lotte Mart Seoul Station Branch is connected to the subway station. wah I love the korean food ! Will go there someday, nice sharing ! Thanks, hope you will enjoy it! Lugging luggage around is possibly the worst part of travel, especially when we have to locate our destination. Loved reading your experience. Love the pictures dear and the Korean dishes are absolutely tempting. Enjoyed reading your experience dear - looks like you had a lovely time. And it has been my favourite supermarket! Ohh dear!! I'm really jealous huhu! Wanna visit Seoul someday!!! Great photos by the way. Yayy! Thanks! Hope you can visit one day! my favourite shopping places too! Korea! How I wish I will be there. One day oh One day. Thank you for sharing this as I will visit Seoul next year. I have bookmarked it. cool kids in campus..i like! :D now when can i visit there. OMG all the interesting places！ so photogenic, I gonna put in my list for my travel to korea next year! wow....nice photo and nice place....next month will fly to there!! Lotte World is everywhere in Korea and I love every single one of it! I love the fashion street where they sell beautiful and affordable fashion too - the fashion street being anywhere they sell great fashion! Yes, and they have so many underground shopping centres! I wish I could visit Japan too! Korea looks like a fascinating place. I enjoyed reading about your trip and great pictures too. Shame about the Made in China clothes but you can't avoid that - it's the same everywhere in the world.. Thanks alot! And yes, you're right about the Made in China clothes. Love the pictures! Great post! Do check out our Seoul Travel Itinerary as well!